Advertising with CANS can help you reach your ideal target market, with many different options to choose in both print and online media, there is sure to be something for everyone. Invest in a one-time placement, buy an Ad Package, or build work with our team to build a custom package tailored to your advertising needs. Approximately 1700 copies are sent to CANS member companies, architects, engineers, school boards, hospitals, municipal engineers, property managers and government buyers. Ad spaces are available on a first come first serve basis, should your selection be sold out you will be contacted by a CANS Representative. All ads are printed in full color; all ad prices are plus HST. Artwork for advertisements can be submitted directly to Colleen Fiske, Communications & Marketing Lead at cfiske@cans.ns.ca. Payment must be received in full before January 30, 2019, and must be received to guarantee ad placement or hold your space. 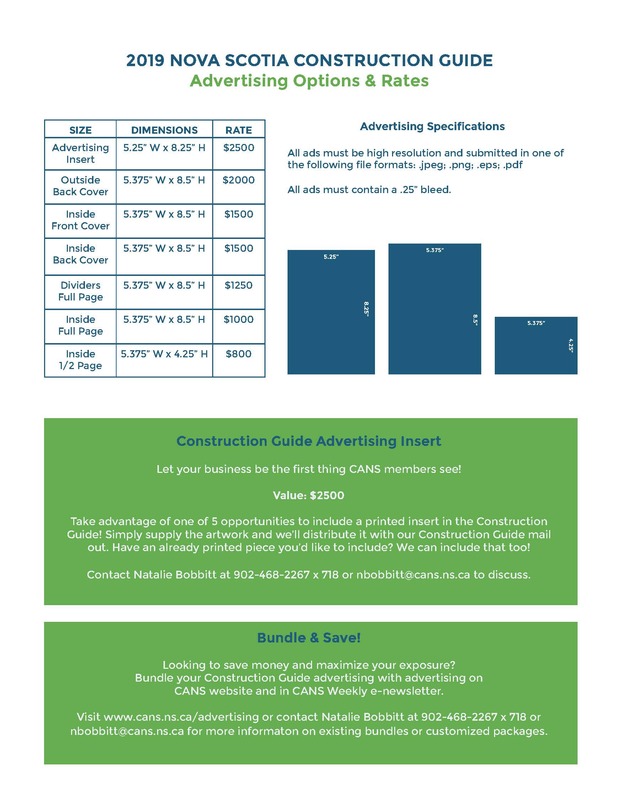 To advertise, select your preferred ad space from the options below, or email nbobbitt@cans.ns.ca. Note that ad space options are listed below in alphabetical order. Please read the Description box beside each ad option, and make your selection carefully to ensure you purchase the correct space.